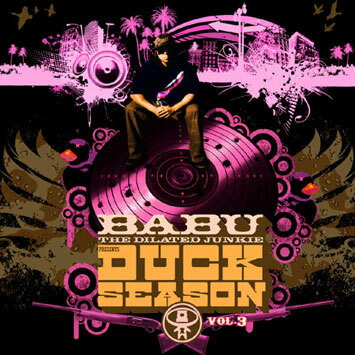 Third volume of "Duck Season" series by renowned battle DJ / member of Dilated Peoples, Beat Junkies. He's won numerous turntable competitions, including the 1997 DMC USA Championship. Volume 1 peaked at #30 on Billboard's "Top Independent Albums." 02. Dearly Departed - M.O.P. 06. East West Connection - A.G.
12. It's A New Day - M.E.D. Sorry for the hiatus ya'll, i really had to put my head down and focus on mixing, mastering, and finishing up the artwork for my record... it was a lot of hardwork and long hours but i loved every minute of it... but it's official ya'll I HAVE FINISHED!!!!! DS3 drops on October 28th, 2008! I'm super excited for the world to hear this record, it's been like 2 years, on and off i've been working on it, but i think the delay was worth it becuz it came out INCREDIBLE! i know, i'm a little biased (LOL), but u be the judge, on my page i've put up for FREE DOWNLOAD my new single "DEARLY DEPARTED" ft. M.O.P.!!!!!!!! Also as a lil treat, i've also put up my son NIKO'S new song from DS3 "Ahead of My Time" for ya'll to peep! I hope u enjoy, lemme know what u think! i'll have more leaks from the DS3 comin' soon!!!!! Babu's influence in hip-hop started in the 1990s, as he played an essential role in the evolution of the "DJ" with the Los Angeles collective, The World Famous Beat Junkies. Taking his talents to a higher level, in 1997, he stormed the dj battle scene and was the first to win all 3 categories (Scratching, Beat Juggling, and Teams) at the International Turntablist Federation. While continuing to be a dominant force in the battle scene, Babu released a number of ground breaking mixtape albums combining intricate mixing and turntablism. From these releases, the most notable included "Comprehension", "Duck Season Vol. 1 & 2", and his 1999 collaboration effort "Sound Bombing 2" (Rawkus Records) with fellow Beat Junkie, DJ J Rocc. As an official member of the West Coast group Dilated Peoples he stands at the forefront, as the group's DJ, he preserves the art of turntablism and lets all fans know that the DJ is the backbone of hip-hop. One of the most documented DJs in the world, Babu continues to appear in both national and international media outlets, including live television showcases on MTV's "Sucker Free" and BET's "Rap City", as well as feature stories in high profiled music publications such as VIBE, Source, XXL, and Rolling Stone. Produced by DJ Babu (Dilated Peoples / Beat Junkies). Featuring guest appearances by M.O.P., Dilated Peoples, Little Brother, MF Doom, Sean Price, Guilty Simpson, AG, Bishop Lamont, MED, Strong Arm Steady, Oh No, Cali Agents, Roc Marciano, etc.